The launch this year of the completed Wales Coastal Path has produced a new book by Jon Gower as well as numerous newspaper articles. One in Mr Murdoch’s flagship Sunday paper described Dylan as a “…drunkard and sometime poet…” which just displayed the ignorance of the media who would not want the truth to get in the way of a good story. If you have a concern about Climate Change and a love of poetry then the Pontardawe Arts Centre was the place to be in early June 2012 for And This is Global Warming with readings from Elin ap Hywel, Sue Richardson, Dafydd Wyn, Emily Hinshelwood and the winners of Awel Aman Tawe’s Climate Change Poetry Competition. Sue Richardson was at the Dylan Thomas Birthplace last October for the International Festival of Words. She draws on her experiences in some of the colder parts of the world and is passionate about climate change and how it is affecting the world. Dylan Thomas once, when describing A Visit to America, referred to the list of visiting lecturers to include “…fat poets with slim volumes…”. Tony Webb is a well built man and his first book of poems, lyrics and short stories – Down a Sparrow Lane – is certainly fatter than Dylan’s 18 Poems. Nonetheless it is a delightful read which draws on his past and particularly his years of growing up in the east of Swansea. The book launch at the Brunswick in Swansea was a memorable evening of music, readings and laughter. All the better for the introduction by poet Malcolm Parr being half way through the evening on account of him disappearing to the loo. Tony is perhaps better known as the front man for the Swansea folk/rock band Sparrow Lane and the book contains a number of lyrics to songs that he has written. The short stories include He Only Swore in Welsh which tells of his early life living close to his grandfather. Unlike Dylan’s obtuse early poems Tony’s are easy to understand and are drawn from a lifetime living in Swansea. Even his adventures further afield as in London, New Year’s Eve convince him there is no place like home. And home is not all roses – The Boy in the Subway is a tale of our time – sad and haunting. Tony will be appearing at the Dylan Thomas Birthplace in October – don’t miss it! Once upon a time there were two ferries…. The news this week that the much heralded Swansea Ilfracombe ferry link is unlikely to get under way until next year is a bitter blow to tourism operators on both sides of the channel. Last week was the start of the festival season in and around Wales and I could not have witnessed two more diverse events only 50 miles or so apart. 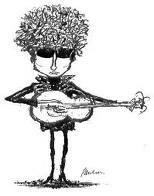 Bob Zimmerman, Dylan and John Lennon – what’s in a name? Oh dear – I’ve just offended an American! I stumbled across a blog called the Ten Minute Ramble with some videos of Bob Dylan and just pointed out that he took his name from our own Dylan. Volcanic ash – making a crisis out of a puff of smoke? Yesterday we arrived home from an extended holiday in Spain – thanks to the fallout (or should it be “fallouts”?) from the Icelandic volcano eruption our stay was extended from seven to fourteen days.